First off, while Fuuka does act as a sequel to Suzuka you don’t need to have read Suzuka to jump into Fuuka comfortably. While Fuuka does make little nods here and there to Suzuka it’s not enough to make you have to go back and read the old series. New comers can quite happily enjoy Fuuka without knowledge of Suzuka as I have done. With that said lets jump into the review proper! When Crunchyroll first picked up Fuuka as a new Manga I wasn’t greatly interested. The art looked good but the plot sounded generic, so my hopes weren’t all that high. 35 chapters later and my opinion couldn’t have changed more. Fuuka is something special and something I’m really pleased I decided to give a shot. Fuuka is telling the story of Yuu Haruna, a young boy with no real ambition in life and who spends most of his time on Twitter. After his parents move to America for work, Yuu moves in with his three sisters in a new town. Upon his meeting with Fuuka Akitsuki he finds himself drawn to her and wanting to know more about this mysterious girl before him. After a misunderstanding between them is cleared up we realise Fuuka is a bit of an oddball with a massive passion for music. She spends most of her time on the school rooftop listening to a number of different songs and pondering the world. As our story progresses Fuuka and Yuu get closer until the two, along with some friends, start a band of their own. As time goes on, however, it’s clear that there are romantic feelings between the two but with a rival for Yuu’s affections introduced in the form of an old school friend just how will things work out? Fuuka is trying to do two different things here. It’s trying to be a romantic drama, coming of age tale but attempting to do all this with music at its core. It can’t convey it’s feelings in music quite as well as an anime adaption would do (which I really hope happens someday), but the manga is drawn so well that it doesn’t matter. Fuuka succeeds at pulling at your heart strings when the band are playing music and facing their seemingly endless problems. All told the series works really well, granted this is likely due to Koji’s experience in the manga field for so many years now. His art is polished and pretty to the eye. Character designs really stand out and even the backgrounds will draw you in. Fuuka is a well drawn piece of work and certainly deserving of a lot of praise there. That isn’t to say the story is weak though – as it truly isn’t. For something so focused on music which the medium just can’t convey as well as others can, it’s truly an impressive series. All the characters are strong and you can understand why they’re doing everything they are. Yuu isn’t the most interesting of characters, but as we go through the story with him it’s hard not to become fond of the guy. Fuuka is a lot more interesting and while she comes off as mysterious at first we quickly realise she’s a warm and kind girl at heart who really, really loves music and everything about it. Right now the plot seems to be at a bit of a settling point having dealt with some rather steep hurdles as of late, but it’s clear big things are to come for our characters and I can’t wait to see what happens next. Fuuka is released weekly in English by Crunchyroll and has me eagerly awaiting its release every week. It really doesn’t feel like anything special to begin with, but give it a few chapters and you’ll easily be drawn into this story and our cast. I’d love to see an anime adaptation turn up someday, but right now I’m just looking forward to following more of Yuu and Fuuka’s tale. Crunchyroll have picked a winner in Fuuka. The series is well worth your time if you’re a fan of music and a good dose of romantic drama here and there. 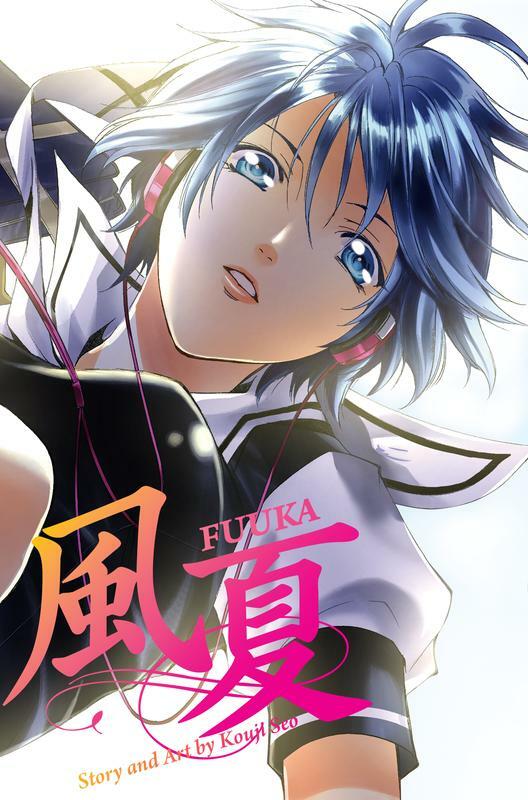 Fuuka is published weekly by Crunchyroll outside of Japan. The series is currently up to 35 chapters, all of which we’ve read for this review, with no sign of ending anytime soon. This entry was posted in Manga, Manga Reviews, Reviews and tagged Crunchyroll, Fuuka, Koji Sei, Manga, Review, Suzuka on 16th October 2014 by Demelza Ward.